Thatslyf | your guide to right pair of sunglasses…. Donning the right pair of sunglasses is considered to be an integral part of the fashion and style statement of individuals. The sunglasses not only protect the eyes from the harmful effects of being exposed to sunlight but also add to the elegance and grace of the wearers. However, to ensure that perfectly stylish look, it is important for individuals to be aware of the different types of sunglasses that would suit their unique face cut. For this they need to have a good understanding of the shape and size of their face so that they are able to choose a perfectly fitting and functional pair of sunglasses. Discussed below are some common face cuts and the types of sunglasses that would perfectly suit each of them. Round Face Cut: People with a round face cut generally have more curves and smoother angles in their face. 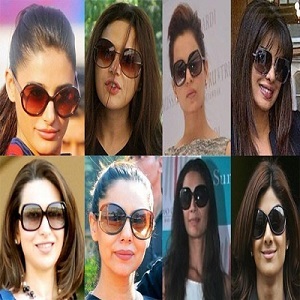 For such people a perfect pair of sunglasses would be the one that has minimum curvature and rather helps in enhancing the sharp angular features of the face. This helps in making the face look longer and giving it a thinner and sharper appearance. Sunglasses styles that are rectangular, square shaped, wrapped and shielded or even feature colorful frames generally look great on individuals with a round face cut. Square Face Cut: Individuals with a same face length and breadth are generally categorized as having a square face cut. The prominent features of their face include a broad forehead and a strong jaw line. For such individuals, sunglasses with round or oval lenses are just perfect as they help in balancing the excessive sharpness of the face. Sunglasses that support aviator or butterfly styles or have frames with oval or circular curves are the most successful for individuals with this particular face cut. Oval Face Cut: People with an oval face cut generally don’t have to worry much about choosing the right sunglasses as they look good in almost anything they wear. Individuals with such face cuts have gently rounded and fairly even features which ensures that almost every style and frame type works well with them. However, it is best to avoid huge frames that might hide the perfectly symmetrical features and rather opt for sunglasses that provide cover from the eyebrows to the cheekbones. Oblong Face Cut: Individuals with oblong or rectangular faces generally have a long and narrow face with sparse narrow angles. For such individuals, sunglasses having larger wayfarer and rectangular lenses or the ones that are oversized or have really thick frames are considered to be most suitable. Such sunglasses help in giving a wider look to the face. Alternately, people with oblong face cut can also use sunglasses that have tall deep lenses with vintage style frames so as to make the soft features look sharp and edgy. The styles that suit such people the most include wrap, shield, square, wayfarer and rectangle. Daimond Face Cut: The most prominent facial features of people having a diamond shaped face are the narrow jaw line and forehead besides really wide cheekbones. It is advisable for such people to wear sunglasses with frames supporting gentle curves or having oval and rimless frames. This not only helps to compliment the wide and high cheekbones but also highlight the narrow jaw line. However, care should be taken to choose frames that not wider than the cheekbones of the wearer. Heart Face Cut: Individuals with heart shaped or triangular faces are easily identified by their really wide temples and extremely narrow chins. The sunglasses that work the best for such people should preferably have wide lower edges with minimum or no straight lines along the top. This helps in focusing the attention of the onlookers towards the lower part of the face and creating an elongated look. To get a more balanced look it is advisable to choose lenses that support cat-eye styles or rounded edges. The sunglass styles that suit this face cut the most include shield, rimless, butterfly and aviator. The above guidelines can go a long way in making the daunting task of choosing a really cool looking pair of sunglasses extremely easy. With the market offering a huge variety of shades, people with diverse face cuts can now get the right look with a great pair of sophisticated and streamlined sunglasses.